Plastic Stool - BT-131-GG Mobile or Stationary Stool with Chrome Base. Free shipping to the lower 48 United States for this Flash Furniture office stool. 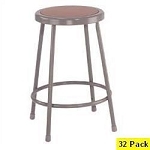 Note: this listing is for only 1 stool. Select from either a stationary or a mobile leg design. Get a stool set up for your office or work space with this plastic stool from Flash Furniture. The seat features a high-density plastic seat with a glossy, black finish. The base is chrome and can either have legs with stationary feet or legs with rolling casters. 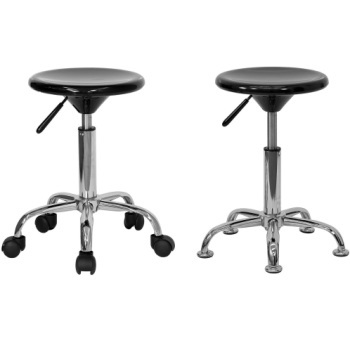 The main structure of the office stool features a height adjustment mechanism for versatility in height setting depending on your needs. Order your office stools here. Choose from either stationary floor glides or rolling casters. Seat Size: 13 inches W x 13 inches D.
Seat Height: 17 - 23.25 inches H.
Overall Width: 13 inches W.
Overall Depth: 13 inches D.
Overall Height: 17 - 23.25 inches H.
Shipping package dimensions: 17 inches x 8 inches x 17 inches. Dimensions: 17" x 8" x 17"